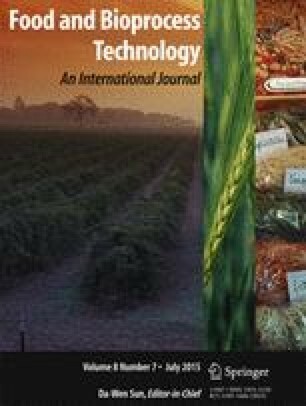 The current study was conducted to investigate combination impacts of κ-carrageenan (CAR) and soy protein isolate (SPI) on the functional properties of chopped low-fat pork batters during heat-induced gelation. Texture profile analysis, sodium dodecyl sulfate-polyacrylamide gel electrophoresis (SDS-PAGE), Raman spectroscopy, and scanning electron microscopy (SEM) were used to determine the properties of pork batters. The addition of individual CAR and SPI or CAR/SPI mixture improved textural properties except for cohesiveness compared with the control (P < 0.05). The cooking loss with supplemented ingredients was significantly lowered, while the thermal emulsion stability was improved compared to that of the control (P < 0.05). Compared with the control, the CAR/SPI mixture formed a more continuous structure evidenced by more uniform fat particles and a more compact protein matrix. Raman spectroscopy showed that pork batters with ingredients resulted in a lower content of α-helice and a higher content of β-sheet, β-turn, and random coil compared with the control. However, no interactions between meat protein and CAR/SPI could be identified by SDS-PAGE profiles. The results indicate that the combination of CAR/SPI can be effectively used to improve functional properties of low-fat pork batters effectively. This research was funded by the Twelfth Five Issues of Rural Areas of People’s Republic of China (2012BAD28B03).